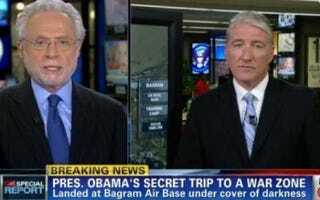 "When President Barack Obama arrived Tuesday in Afghanistan on the first anniversary of the killing of Osama bin Laden, it was supposed to be a secret, like his earlier visits to the dangerous region," M. Alex Johnson reported for msnbc.com. "But news of the trip leaked out hours earlier, raising new alarm bells about the president's security. "The Afghan news station TOLONews reported early Tuesday that Obama had arrived in Kabul, hours before the White House's embargo on reporting the news was lifted. Other news organizations, including The New York Post and the official Chinese news agency, Xinhua, cited that report, which was attributed to unnamed Afghan officials. ". . . Obama's official schedule for Tuesday indicated that the president was remaining in Washington all day. "In fact, he had left Joint Base Andrews, Md., aboard Air Force One shortly after midnight Tuesday morning. "In the face of the official denials, the Post removed its report, as did BuzzFeed, which deleted a tweet noting the news after an NSC official called it to argue that its report endangered Obama's life, it said." "Obama arrives in Afghanistan report says; White House denies it," read the Post's headline. . . .
" 'Where is Obama,' read a similar headline on The Drudge Report. Many of the publications that posted early reports on the president's visit later pulled their stories. However, The Drudge Report kept its post up. "At the time, all those reports were wrong, or at least premature, according to the administration." "NBC News and other news organizations learned about the trip Tuesday but withheld reporting it until Obama arrived at the palace. But 'the fact so many U.S. reporters knew about it made it easier for it to disseminate,' Kessler said. "Kessler suggested that the Obama administration follow the example of the administration of former President George W. Bush, 'which did not let reporters know beforehand at all' when Bush traveled to Afghanistan." "When Barack Obama met Genevieve Cook in 1983 at a Christmas party in New York's East Village, it was the start of his most serious romance yet," Vanity Fair writes in introducing an adaptation from the biography "Barack Obama: The Story," by David Maraniss, an ssociate editor at the Washington Post. "But as the 22-year-old Columbia grad began to shape his future, he was also struggling with his identity: American or international? Black or white? Drawing on conversations with both Cook and the president," Maraniss "has the untold story of the couple's time together." In a separate question-and-answer, Vanity Fair's Jack Deligter asked Maraniss, "When you decide to write the biography of a living subject, how does the process work?" "The most important thing for me is to block out the conventional wisdom of the moment, the Zeitgeist, what everyone is saying about that person — it almost requires the mind-set that my subject is dead and gone," Maraniss said. "The pressure to conform one's material to the popular assessment of the moment is a danger that leads to bad history and transient writing. I want my books to last, to stand the test of time, and to do that I focus on the forces that shape the subject — the cultural and sociological geography — to capture them in a way that will explain them no matter what they are doing." Deligter: "Were Obama's own books — Dreams from My Father and The Audacity of Hope — source material or impediments to you?" "Memoir and biography are two very different things," Maraniss replied. "In the introduction to Barack Obama: The Story, I say that his memoir is a remarkably insightful exploration of his internal struggle but should not be read as rigorous factual history. It is not, and the president knew that when he wrote it and knows it now. I found his memoir extremely valuable in understanding him. But I did not rely on it for chronology, nor for fleshing out the stories of other people in his life. The theme of his memoir is race, and so both the chronology and the characters in his writing were used to advance that theme." Paul Cheung and Janet Cho have filed to run for national president of the Asian American Journalists Association in a replay of the 2009 contest for vice president-print. Cho beat Cheung then by one vote, 165 to 164. Cho, a business reporter for the Plain Dealer in Cleveland, was last in this column two weeks ago, when she explained why, as an AAJA representative to Unity: Journalists of Color, Inc., she voted against changing its name to Unity Journalists, a successful request made by the National Lesbian & Gay Journalists Association, the coalition's newest member. Asked his position on the name change and the admission of NLGJA to Unity, Cheung told Journal-isms by email, "Since NLGJA's admission to UNITY and the name change are decided already, it's vital for me to focus on the goals of my presidency: how to include more minorities and journalism leaders in shaping the future of our industry." "After 15 years on the AAJA National Board, including four years as National Secretary and five years as National Vice President for Print, I'm finally running for AAJA National President. I'm proud to say I have the financial support and enthusiastic encouragement from my editors at The Plain Dealer to take on this role in addition to my job as a business reporter. I will also continue to represent AAJA on the UNITY Journalists board. "AAJA members know that I've never sought national office with a personal agenda or for personal glory, but always to better serve our extraordinary members, ensure our financial stability going forward, and navigate this great organization through the uncertain waters ahead." Cheung set up a Tumblr page devoted to his candidacy. "By day, I'm the Global Interactive Editor for the AP. By night, I'm a critical optimist of pop culture," he wrote. "On the side, I'm fixing online commenting at Newspanion.com and teaching a class at Columbia. And now, I'm running to be AAJA's next national president." Cheung lists four priorities, "Expand our skills," "Grow and diversify our membership," "Build a sustainable future" and "Forge a closer relationship." He adds, "I also have a deep understanding for AAJA's mission and priorities. As an ELP graduate, I helped create last year's Our Chinatown media demonstration project. As a JCAMP trainer, I have mentored young journalists. As a former convention co-chair and UNITY programming co-chair, I created workshops that also brought sponsors to AAJA. And as a board representative for both small and large chapters, I understand the challenges each of you is facing." J Camp is a multicultural high school journalism workshop. ELP refers to the Executive Leadership Program, designed to advance diversity in media management. Kathy Chow, AAJA's executive director, said the association would announce the candidates on Friday. Absentee voting begins June 1. Robert E. Pierre, a 19-year veteran of the Washington Post and editor of its theRootDC section targeting African American readers, is leaving the paper, Post editors told the staff on Wednesday. The Newspaper Guild, meanwhile, confirmed it was meeting with management about the effect the paper's buyout program is having on newsroom diversity. In their note to the staff, Executive Editor Marcus Brauchli and Managing Editor Liz Spayd outlined Pierre's Post career, covering suburban Prince George's County, Md., the Maryland State Legislature, then-District of Columbia Mayor Anthony Williams, juvenile justice issues and communities east of the Anacostia River, an area often described as "forgotten." Pierre was also a Chicago bureau chief and a local editor. "But that only begins to describe Robert's impact in this newsroom," Brauchli and Spayd continued. "He was the first one to propose doing a project on black men, back in 2000, and was a key member of the group that conceived of the groundbreaking 'Being a Black Man' series that ran in 2006. He wrote one of the early pieces — about a black boy growing up in a predominantly white suburban enclave. It was an illustration of the growing ranks of upwardly-mobile black families who are settling everywhere, and of the black children who are being raised in privileged environments. ". . . Most importantly, Robert has often been the conscience of The Washington Post. He was never afraid to challenge the fundamental ideas behind our strategy and direction, even when those challenges were aimed directly at newsroom leaders. He has always cared passionately about this institution and our mission as journalists. 'He has fire in his soul,' National Editor Kevin Merida said." As newsroom reports circulated that Pierre, a former president of the Washington Association of Black Journalists, was taking the buyout, Pierre steadfastly refused to respond to inquiries from this column. But Brauchli and Spayd said, "He's planning to hang his shingle as a consultant." Discussing the buyouts two weeks ago, Fredrick Kunkle, co-chair, News, of the Post's unit of the Newspaper Guild, expressed concern "that a high number of the participants are Asian, African-American or Latino. By our count, more than a dozen of these Guild-covered employees are minorities, most of whom are black." Kunkle confirmed Wednesday that "management is talking to the Guild about diversity in light of the buyouts." Others of color taking the offer include Michael D. Bolden, a Local desk editor; Joanna Hernandez, a multiplatform editor who is president of Unity Journalists. ; Sara Goo, real estate editor; Shauné Hayes of the News Information Technology department; news aide Stephen A. Crockett Jr., assigned to the Universal Desk, Kerry Flagg, sports editorial aide; photographer Mark Gail; Tony P. Knott, an assistant news editor; and Lisa Frazier Page, social issues editor on the Local staff. Page, Goo, Hayes and Pierre are not covered by the Guild. HuffPost Replaces AOL Latino With "Online Community"
The Huffington Post Media Group Tuesday announced "the launch of HuffPost Voces, a Spanish-language online community for Hispanic Americans and all who take an interest in the Latino community. "HuffPost Voces (http://voces.huffingtonpost.com) incorporates and enhances the former AOL Latino, the #2 Hispanic website*, with The Huffington Post's signature mix of news, blogging, community, and social engagement," an announcement said. The asterisk referred to a February report from the comScore Inc. research firm. "HuffPost Voces will have a dedicated editorial team and share a publishing platform with HuffPost LatinoVoices, which is a rapidly growing English-language site launched in August 2011 for the U.S. Hispanic community. The individual but cross-pollinated sites reflect the state of Hispanic America and cater to the fast-growing, increasingly influential population of bilingual/bicultural Hispanics — an audience that gets its information and entertainment from both English-language and Spanish-language outlets. . . ."
Miguel Ferrer was named managing editor of HuffPost Voces. He is already managing editor of HuffPost BlackVoices and HuffPost LatinoVoices. ". . . Bloggers will include Antonio Villaraigosa, Mayor of the City of Los Angeles; Dolores Huerta, co-founder of the United Farm Workers with Cesar Chavez; Maria Teresa Kumar, co-founder of Voto Latino; and U.S. Congressman Xavier Becerra," the news release said. "As his campaign [hurtles] toward election day — aggressively expanding its operation, and sharpening its focus on general election battleground states — Mitt Romney appears to be testing one of the central tenets of campaign conventional wisdom," McKay Coppins wrote Wednesday for BuzzFeed. "The question: Can he win a national election in 2012 without courting the Spanish language media? "While there's still plenty of time for a campaign course correction, Romney has exhibited little urgency in building a relationship with the Hispanic press, according to Latino reporters, activists, and political surrogates on both sides of the aisle." "PBS said Wednesday it is preparing a six-hour documentary series on the history of Latinos in the United States, set to air in the fall of 2013," the Associated Press reported. "English and Spanish-language versions are being produced for the project, which will air across three days. The supervising producer is Adriana Bosch, a Cuban-American who recently did a documentary for PBS on Latin music. "Bosch said she began meeting with officials at WETA, the PBS station in Washington, in 2008 about the project. They spent nearly three years putting funding together before starting with the filming. "It was in 2007 that Hispanic organizations criticized PBS and filmmaker Ken Burns for inadequately representing the contributions of Latinos in his 15-hour documentary on World War II." "Lilia Luciano, a Miami-based NBC News correspondent, is no longer working for the network, TVNewser has learned," Chris Ariens reported Wednesday for TVNewser. ". . . That edit resulted in the dismissal of the NBC News Miami producer. NBC News confirms with TVNewser that Luciano is no longer with the network. She joined NBC News from Univision just 18 months ago. Luciano is the third NBC employee to have lost their job over this story. As TVSpy reported last week, WTVJ reporter Jeff Burnside was fired for a similar circumstance." "At my request, NPR has released more information than any mainstream media organization on the diversity of its editorial staff and audience, Edward Schumacher-Matos, NPR ombudsman, wrote Tuesday. "My analysis two weeks ago turned on the question of which baseline to use in measuring progress. Now I have asked six national leaders and experts of different views what they think of how NPR is doing. They responded with great insight, some frustration and dollops of humor. The goal is for NPR to sound like America." The six are Paul Delaney, theRoot.com contributor and former NPR board member; Rep. Mike Honda, D-Calif.; Rhonda LeValdo, president of the Native American Journalists Association; Janet Murguía, president and CEO, National Council of La Raza; Charles Murray, W.H. Brady scholar, American Enterprise Institute; and Michael Schudson, sociology professor, Columbia Journalism School. "According to a book published in the Argentine capital, major Latin American newspapers with access to the secret cables obtained by [WikiLeaks] decided not to print them because doing so would run counter to their own interests," Marcela Valente reported from Buenos Aires Monday for Inter Press Service.
" 'Wiki Media Leaks', by journalists Martín Becerra and Sebastián Lacunza, analyses the information about the relationship between the region's newspaper companies and the United States, through its embassies. ". . . The book by Lacunza and Becerra, who holds a doctorate in information sciences, shows that in some countries like Argentina and Brazil, renowned columnists from newspapers and television programmes have taken their protests against their (left-wing) national governments to U.S. embassies, where they have sought support for their opposition arguments. ". . . Lacunza told IPS that the practice of appealing to the embassies, while governments were attempting to create more progressive laws on the media, had turned out to be 'a failed strategy' by the media, 'belonging to bygone decades.' "
The northern Nigerian militant group known as Boko Haram, which last week took responsibility for the bombing of three media houses, killing nine people, named the Voice of America and other media establishments and employees Tuesday as their next targets. "In an 18-minute-long [YouTube] video, the group threatened to attack more media houses, naming Voice of America (Hausa), Radio France (Hausa), Daily Trust, Guardian Newspapers. The group also gave reasons why they bombed Thisday office in Abuja and other media houses last Thursday," Ruth Yamta reported for the Leadership newspaper in Abuja. In Washington, VOA spokesman David Borgida told Journal-isms, "VOA has no comment, but takes the safety of all its journalists very seriously." Yamta's story added, ". . . the Inspector- General of Police, Mohammed Abubakar, has ordered [commissioners] of police in all states to intensify security in all media houses nationwide. "Meanwhile, Newspaper [Proprietors'] Association of Nigeria (NPAN) has summoned an emergency meeting of members to deliberate on the matter." The Voice of America added, "Boko Haram, whose name means 'Western education is a sin' in the Hausa language, is trying to turn Nigeria into an Islamic state. Human Rights Watch says the group has killed more than 1,000 people since 2009." * The Rapid City (S.D.) Police Department investigated the case of Vernon Traversie, a 68-year-old blind Lakota man who returned from Rapid City Regional Hospital last fall with three Ks carved or burned into his abdomen, and "found no evidence of criminal activity," Tarah Heupel, a spokeswoman for the department, told Journal-isms on Wednesday. The investigation was closed on Oct. 18, she said. News directors for the ABC, CBS and NBC affiliates in Rapid City did not respond to an inquiry about whether they have reported on the case, which some in Indian Country say has been neglected by local media. Evan Coughlin of the Aberdeen bureau of KSFY-TV in Sioux Falls, across the state, interviewed Traversie on Monday and reported the story on Tuesday night. * "Last week, sources told us the Denver Post planned to lay off two-thirds of its copy editors as part of a newsroom restructuring, with discussion of the plan slated for a Monday meeting," Michael Roberts reported Tuesday for Denver's Westword. "That get-together took place, and while Post editor Greg Moore hasn't responded to our interview requests at this writing, an attendee confirms the two-thirds figure and includes details of an approach that's drawing strong objections from the Denver Newspaper Guild." * Attallah Shabazz, the eldest daughter of Malcolm X and Betty Shabazz, was among the mourners for CBS newsman Mike Wallace in New York Tuesday, Lloyd Grove reported for the Daily Beast. Wallace and CBS cameras were present in 2003, when Louis Farrakhan, leader of the Nation of Islam and Attallah Shabazz spoke together publicly for the first time in 2003 about the role Farrakhan played leading to her father's assassination. * "Alex is Chiu, the celeb-friendly writer who resigned as a senior writer at Time Inc.'s People last week, is heading to Bauer Publishing's In Touch in a very senior job," Keith J. Kelly reported Tuesday for the New York Post's Media Ink column. "Bauer yesterday confirmed the defection, telling Media Ink that Dan Wakeford, the current editor-in-chief of Life & Style, is now going to also become editor-in-chief of Bauer's larger circulation In Touch title. Bauer Publications late yesterday confirmed that Chiu is indeed the new In Touch executive editor." Chiu, who wrote the current People cover story on Beyoncé, has been a member of the Asian American Journalists Association. * A tweet published Tuesday by media blogger Jim Romenesko asks about the Virginian-Pilot in Norfolk, "Two white reporters beaten by a group of 30 black teens & the paper doesn't write it for 2 weeks. Confused.." Managing Editor Maria Carrillo replied, ". . . we handled this situation as if it involved any two people in our community. Police, at this point, still have it officially listed as a 'simple assault.' It has not been determined that this was a hate crime. It's beyond ludicrous for folks to assume that we would not report on this to protect those who attacked our reporters." * Los Angeles Times staff writer Richard Fausset won a Ruben Salazar Journalism Award in the print category for his series on "The New Latino South," CCNMA: Latino Journalists of California announced Wednesday. "The profiles explored the complexities of immigration in a region that has grown increasingly hostile to Latinos. . . . In the TV category, correspondent Yvette Cabrera and producer Saul Gonzalez of KCET-TV in Los Angeles won for their story 'The Border Between Them,' which tells the story of an immigrant family and how ties between parents and children have been tested by deportation and separation. . . .There were no winners in the Radio, Photography or Commentary categories." * Miguel Bustillo, a mainstay of the Wall Street Journal's Texas bureau, has been named deputy bureau chief, Leslie Eaton, the Dallas bureau chief, announced, according to TalkingBizNews. * "Ozzie Martinez has been promoted to assistant news director at WNBC, the NBC O&O in New York City," Merrill Knox reported Monday for TVSpy. "Martinez has been senior daypart manager at WNBC since 2008. He has overseen major breaking news events and the re-launch of the noon and 5 p.m. newscasts." * "The Online News Association, the world's largest membership organization of digital journalists, today announced its fourth year of free traveling digital training, thanks to a renewed grant from the Gannett Foundation," ONA announced Friday. "The $50,000 in funding enables ONA to continue one of its most popular and valued programs, ONACamp . . . ONA has partnered with the Birmingham Association of Black Journalists, the Society for Professional Journalists (SPJ), the Asian American Journalists Association (AAJA), and the East-West Center to ensure trainings reached a diverse audience." * Latinos In Social Media is holding an invitation-only "Top Blogueras Retreat" May 20-22 in Washington. The retreat is to include a " 'Mini-MBA,' with sessions ranging from blog and business best practices, leadership skills, and social good," and a "briefing at the White House, where Administration officials will discuss the top issues affecting our Latino community: Education, Health and Jobs." * "Edward Albee, Margaret Atwood, E.L Doctorow, Zadie Smith, and Kwame Anthony Appiah were among the more than 500 PEN luminaries and supporters who joined last night in honoring Eskinder Nega, one of Ethiopia's most courageous journalists and free expression advocates, with the 2012 PEN/Barbara Goldsmith Freedom to Write Award at its annual Literary Gala at the Museum of Natural History in New York," the PEN American Center reported Wednesday. * "The Palestinian Authority's arrest of journalists and activists critical of its policies are threatening freedom of expression and journalistic freedoms in the West Bank, according to local human rights groups," Jillian Kestler-D'Amours reported Wednesday for Inter Press Service. * "Shutting out international media and imposing dictatorial controls on domestic coverage, the Horn of Africa nation of Eritrea has emerged as the world's most censored country, the Committee to Protect Journalists has found in its newly updated analysis of press restrictions around the globe," CPJ reported on Wednesday. "Following closely on CPJ's 10 Most Censored Countries list are North Korea, Syria, and Iran — three nations where vast restrictions on information have enormous implications for geopolitical and nuclear stability."